On September 4, 2018, an unidentified female entered several retailers in the city of Thousand Oaks and committed fraud utilizing a Coinstar machine located inside each of the retail stores. The amount of the fraud exceeded $950.00. 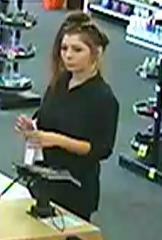 Thousand Oaks Detectives are requesting the public’s assistance to identify the female. Anyone who can identify the suspect is asked to contact Detective Tim Lohman (805) 494-8232. The Thousand Oaks Police Department would like to thank the members of the public for their continued support and assistance in providing information to solve these crimes. We are better at what we do because of our community partnerships.